I’m only going up a number rather than a letter, so you will hopefully understand that nothing conceptual is changing here. The mechs are still modular, still arranged in the same way. Indeed, one of the major drivers for this upgrade is to make them more modular, or more meaningfully modular. 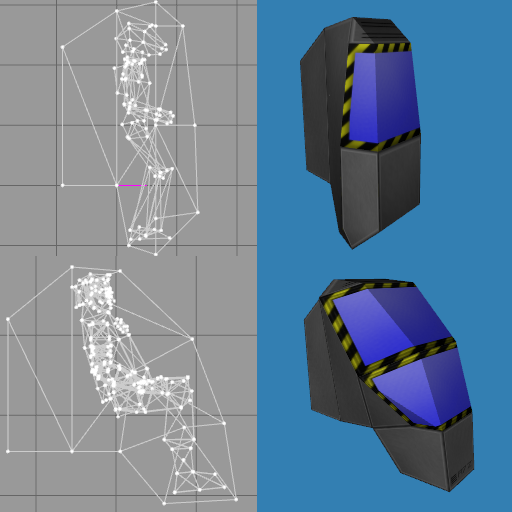 The way Unity works means that I should be well able to realise my ultimate dream of stitching mechs together from parts in-game, rather than having to make a raft of duplicates as in Warcraft III. The keystone of all things RDZ Industries is the Delta mech. 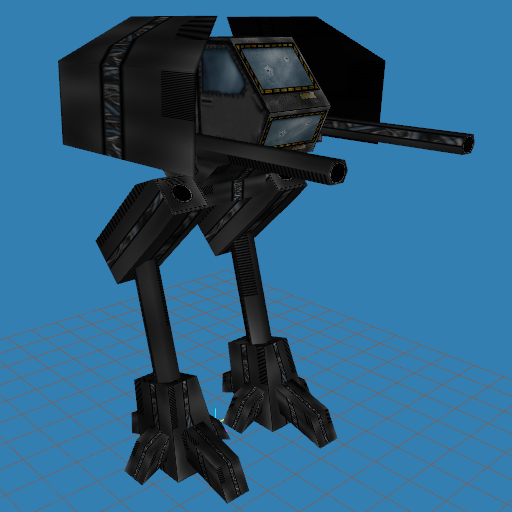 Two legs mounted with a light turret, two cannons and blast shields, it is the “iconic” design from whence all else grows. You seriously do not want to see the wireframe. Mm-hm. Not quite as nimble-looking as the modern Delta, but the basic shape is sort of there. 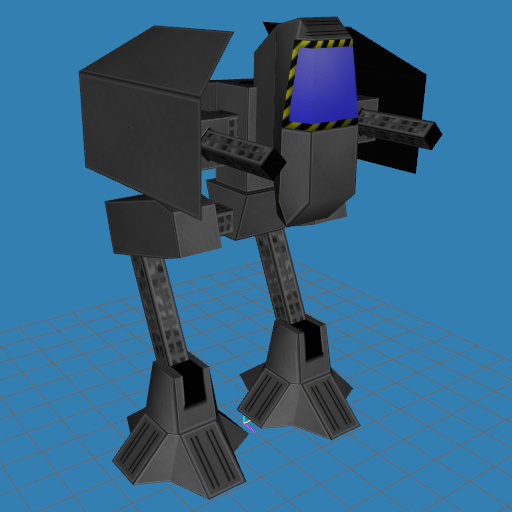 Impractically hovering cannons and random cube turret aside, the silhouette is fairly nice. The texture was originally four Unreal Tournament textures stacked beside each other, but Pins quickly emerged out of nowhere to provide this gritty custom version that rolled for all of Series X. Looking back now, there wasn’t actually much of a change between Series X and Series Y. Series Y3 is where the upright cabin came in. You might notice that it’s a lot squatter than the Y4 version of the cabin — I wasn’t quite using human-sized reference models at this point, so the biggest problem was the lack of scale. No matter how you scrunched up a person, they’d have a hard time fitting into that box. By Series Y3 the Delta design was pretty much fixed. Things really came to a head with Series Y4 because Milkshape introduced some precision texture-mapping controls, along with the life-saving Snap Cursor to Grid option. Suddenly I didn’t have to map the texture by guesswork and wobbly hands — everything from UV-coordinates to joint positions and movements became accurately set along rigid lines and I never looked back. 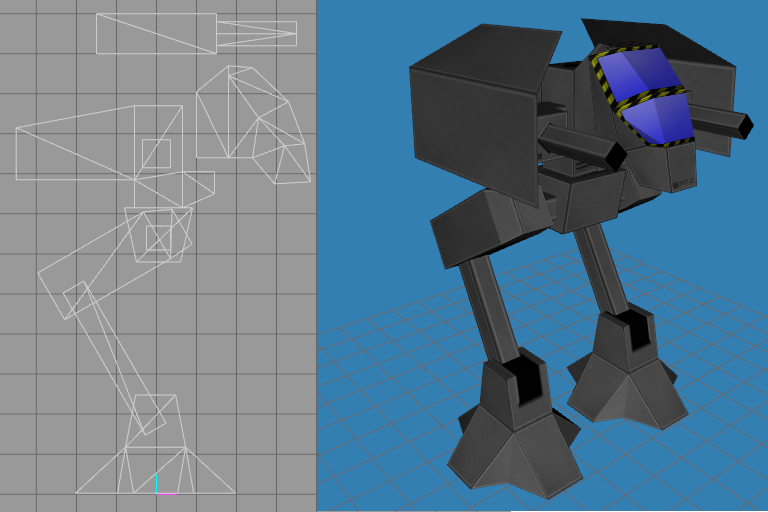 I’m all about precision, so it was a considerable relief to finally reflect that in my models. Smooth and sharp, just the way we like it. The biggest thing I want to change from Y4 is the upright cabin. I might have started to use human reference models, but I never paid much attention to comfort — the human inside would have been hunched in a really peculiar way. 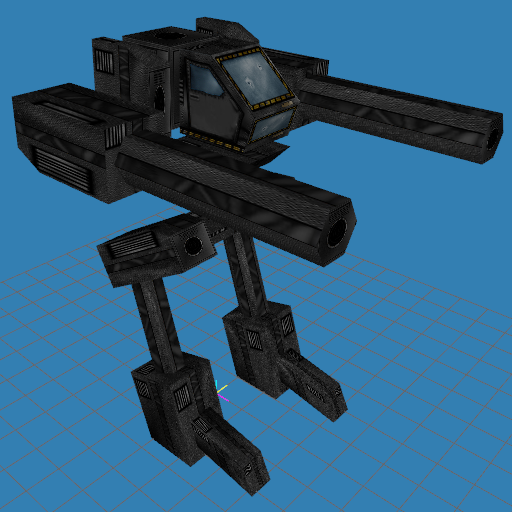 The Y4 design also has a functional problem introduced when it elongated from the Y3 design, in that its bottom dips low enough that it smacks into the mech’s thighs if the turret tries to rotate all the way. Even ignoring the practical problems, you might have noticed that I kept trying — as in the case of the AP-AM itself — to use this cabin horizontally instead of vertically, a position for which it was even less suited. 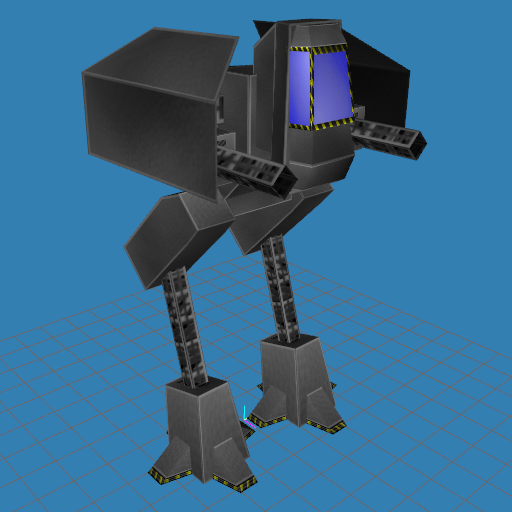 This time, I’ve tried to strike a balance between the upright cab and the stylised pointy-nose beak shape of classic mechs. It seemed like a good pose at the time, but he could hardly even see out that big windscreen. I’ve been using human models from Tomb Raider 3 as the guidelines for the cabin shape, because I’ve still never quite managed to make a human I’m happy with. Although Lara herself is a hideously overpowered 600-odd triangles, the modelling techniques on show are eminently serviceable for my needs. Some more mundane details have gone into the Y5 design too. The cabin now sits on a proper ledge, rather than being unceremoniously shoved into the turret body, while I’ve chunked up the pelvis and removed some unncessary junk from the feet to make them a bit sharper. I’ve also removed some of the texture detail, so it’s almost entirely flat panels here — this might seen like a bad idea from this angle, but add Unity’s superior lighting and a touch of specularity glittering off those hard edges and it’ll really come to life. Yes, yes, it’s made up of cuboids, go away. After its makeover, the Delta sits at 298 triangles. The budget of 300 triangles for the bog-standard Delta, the reference point against which all other vehicles are judged, is upheld. And I wasn’t quite happy with the Y4 Delta’s walk, so I took some hints from the more satisfying AP-AM walk and tried again. Wouldn’t be a new series without a new walk animation GIF! Oh, GIF me a break. This entry was posted in Game Development and tagged No Excuses, rdz industries, Series Y5, Unity3D by Rao Dao Zao. Bookmark the permalink. Just in case you ever thought I might be deadly serious, a few cheap puns bring the tone right back down.